« Welcome to the Nintendo Land tour! Each year I try to put together a little something to help gamers spend more face-to-face time together. 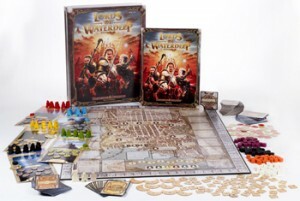 We missed last year but we’re roaring back in 2012 to provide you with some great examples of boardgames to get you and your family gaming. You might not find all these titles at your local mega-mart but many can be found online or in a friendly local game store. Boardgames are relatively timeless so feel free to delve into previous guides for additional advice. This is a fun little trivia based game that can be played by a wide range of ages and abilities. 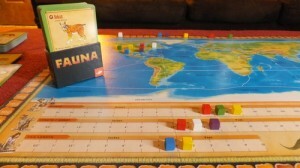 An animal card is revealed and then players take turns using cubes to bet on its habitat, weight, size, and possibly the length of its tail. Correct and close bets win points, incorrect bets lose their cube (you regain one per turn). With plenty of points to be had, and players choosing when to stop their betting, the game is very forgiving even for the non trivia-minded. Bonus kudos for the game board having two sides – one for Metric units and one for the archaic feet/inches/pounds. This quick dice game combines a silly rampaging monsters theme with some take that gameplay to create a surprisingly fun family game for 2 to 6 players. On your turn, roll the dice (possibly several times) and then decide to wreck destruction up on the city or attack the other players. 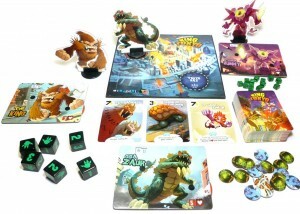 Players use the dice rolled to attack (players or the city), heal, and even purchase power up cards to make their monster even more formidable. Cause 20 points of destruction or eliminate all the other players to win the game. While the dice can be capricious there are many meaningful decisions to be made in this fun, past, humorous game. A new expansion has just been released called “Power Up!” which adds a panda monster and new ways to add powers to your monster. Given the choice, I prefer playing with the expansion as well. This is really just a kid’s game you can find for $20 at your local Toys R Us, but it has gained a sort of cult status among adult gamers as a hilariously fun skill based game. 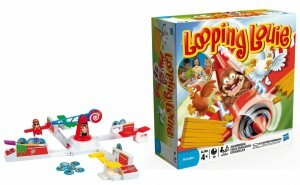 Each player has a little flipper and uses it to protect their chicken pieces from a central rotating barnstormer pilot. Hit the pilot just right and he pops into the air coming down on top of your opponents’ chickens so that they cannot block. No strategy here but a little bit of skill and a whole lot of fun. It really does work for ages 3-100. This is my favorite worker placement game of the past several years, partially from the excellent mechanics and partially from the lighthearted fantasy theme. Players use Elves and Dwarves to gather resources which are then used to build buildings in the five quadrants of the city. Every few rounds, points are awarded for majority of buildings in each city section. What makes the game even more interesting are the use of a player’s buildings to provide new and different options for a player’s workers. A solid game that last just long enough to be fun but not too long to drag on, I highly recommend it. Winner of several gaming award nominations, Village is a nice, solid worker placement strategy game that has two of the most entertaining, quirky mechanics I’ve seen in a while. First, a player’s workers rarely move after they are placed onto the board, however time is a resource in the game and as a player accumulates time their oldest workers “die off”. Second, players select actions by picking up goods cubes, but some goods cubes are actually time markers which give no benefit but age one’s workers. While workers on the board give some benefit, family members can earn points from beyond the grave as the player with the most dead workers of each type earns bonus points at game end. The heart of the game is still to produce items and earn points at various locations on the board but I have found that managing the “death rate” of my poor family members in the Village adds an entertaining level to an already fine worker placement game. Wizards of the coast surprised the industry by releasing a very solid Euro style boardgame with a dungeons and dragons theme. 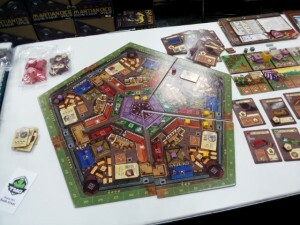 Players take on the role of the hidden power brokers of the city of Waterdeep and use money and people as resources to earn points in this worker placement game. In a cute twist, the people are represented by little wooden cubes of four colors to signify fighters, clerics, wizards, and rogues. Players spend their resources to satisfy quest which grant points and sometimes other special abilities. The game has a nice story arc as players game more workers to place and more locations in which to place them as the game progresses. The game’s only real down side is the annoying half sized box lid which keeps falling off. Suitable for ages eight and up, this is probably the lightest of this year’s family strategy selections. 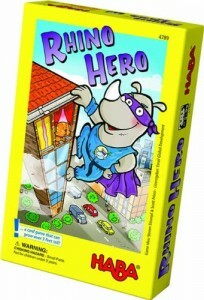 This is a cooperative card game where each player takes on the role of a unique superhero represented by a deck of cards. To play, 3 to 5 players band together to defeat a selected villain and environment both represented by their own set of cards. The game manages to capture a wide range of hero abilities in relatively simple card mechanics. Players must take advantage of beneficial interactions between their hero abilities in order to defeat the villain deck and its associated minions and while the environments deck of cards as a bit of tension and chaos to both sides. This game has gained a large local following of fans enamored with its theme and gameplay. Due to the multiple interactions possible within the game, I recommend this title primarily for those gamers who are at least familiar with the somewhat complicated rules found within collectible card games. 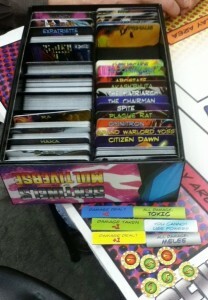 The newest edition comes with handy dividers to keep all the card decks separate. Look for the Enhanced Edition of the game. 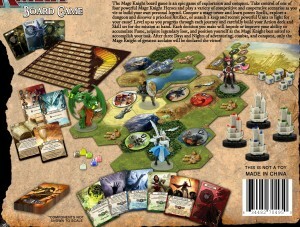 The longest and most complicated game in our list this year, Mage Knight is an adventure game for one to four players. Players are represented by a figure on a board consisting of hexagons that are explored as the game progresses. Mage knight is a deckbuilding game, which means players start with a small deck of cards and slowly improve that deck by acquiring new cards as the game progresses. 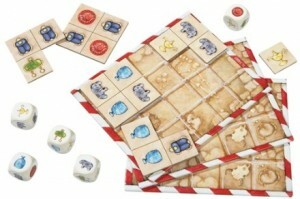 Players take turns using cards to move about the board, attack creatures, recruit minions, and gather resources. When a player runs out of cards all other players get one last turn before the end of the round. Card decks are then reshuffled and a new round begins with players gaining access to the cards they recently acquired. Every card has two abilities, a basic one and a more powerful option if resources are spent. This provides many interesting decisions for players but leads to the games main drawback, its length. While a typical game only lasts three to six rounds, depending on the scenario, it will take a good two hours for even a short game. In its defense the game is worth it. What pushes it over the top for inclusion in this guide is the game’s robust solo play options. As any parent with young kids knows, finding time for a multiplayer game is often difficult. Nothing more than a set of six colored race cars, some colored dice, and a track, Hit the Throttle is a quick playing racing game with dice. Players are secretly assigned two of the race cars and then it turns rolling dice and moving cars based on the colors rolled. There’s just a slight bit of strategy and bluffing in the game but it is simple enough for anyone to play. 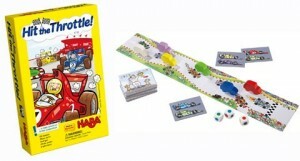 The race car theme goes a long way towards making this a hit with the younger boy set. One of my favorite kid games focuses on finding two matching items on a pair of large cards. 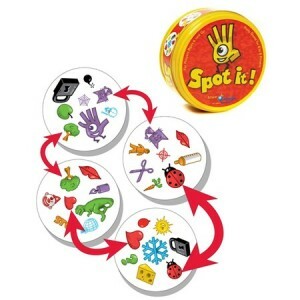 Spot It is an extremely similar game that consists solely of a tin containing a stack of circular cards. If there are several variations of games that can be played but all focus around spotting to similar images on a pair of cards. The images match in color but size and orientation can vary. Spot It has one additional advantage in that it comes in several varieties such as animals (better for young kids), a travel edition (with a car theme), and two sports editions both MLB and the NHL team logos. The game’s low price and handy carrying tin make it extremely portable and just for putting in a Christmas stocking. Another dice game, in Mummy’s Treasure players start with a blank grid on their card and try to be the first to fill it up. Roll the four dice and then select a playing piece matching some or all of the symbols rolled. Care must be taken when placing pieces on one’s card as they cannot be rearranged later. Again, there is not much strategy but some planning ahead does help making the game playable by both adults and children. I consider this game a more portable version of Jenga. Players build a card house layer by layer by selecting roof tiles out of their hand that specify how the next player must add a level. 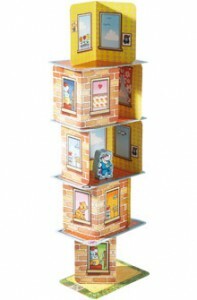 Roof tiles show how supporting cards must be placed and may have additional abilities like allowing extra plays or having to also move a little rhino figurine onto the top level. The game continues until a player is able to place their entire hand onto the tower or a player knocks it over. 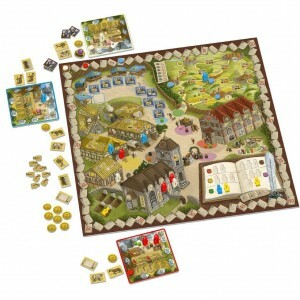 Since the game comes in a small yellow box it is much more portable and can be set up to play on any small stable area. Role Playing Games have surged in popularity in the past couple of years. If someone in your life shows a leaning towards imagination, creativity, or storytelling, an introduction to the world of role playing games might be in order. Very few big new releases stood out this year but a few things caught my eye since I have several very young boys in my household. Somewhere between a boardgame and a toy, Lego Heroica is a line of adventure / exploration games constructed out of Lego pieces. Players take on the role of one of four adventurers, each with a very slight differences, and roll the Lego dice to determine movement and combat. 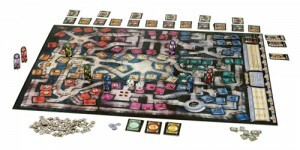 Players encounter monsters and can gain treasure as they attempt to reach the end of the board and defeat the big bad guy. 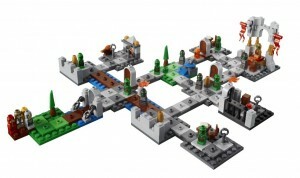 I love all the pieces in the games and how they can be combined to make even larger mega-dungeons when multiple Lego sets are combined. Unfortunately, the game is rather simplistic and does not require many significant decisions. However, I could see this game as a useful steppingstone to a very simplistic role playing game. One would have to make up their own rules, but after all that is what Lego games are all about. With that in mind, any gamer with young Lego fans who need an introduction to role playing should check out this line of games. Yet another boardgame in the role playing category! This is a reprint of the classic 1980s boardgame produced by the same company as Dungeons and Dragons. One to six players take on the role of an adventure exploring a dungeon. The dungeon is divided into six areas of increasing danger. Choose a room, enter it, and then roll dice to determine if you defeated the monster. Thankfully, dice are not used in movement. More challenging monsters guard more valuable rewards. Adventurers come in four varieties with some stronger than others in combat. The game balances this by requiring stronger adventures to gather more treasure before racing back out of the dungeon to win the game. Even without random movement Dungeon! is a luck fest do it the random combat. There isn’t much game here for strategic players but it can be fun for the younger set. Once again, the game can fill an excellent role as a pre-RPG type experience. If you can stand a bit of chaos in your game, there is plenty of fun to be had in enjoying this game’s strong theme. If you have a fantasy role player on your list the Bestiary Box is worth a look even if they don’t play the pathfinder system. Included in the box are plastic stands and cardboard cutouts of a wide range of beasts and other enemies (300 cutouts in all). 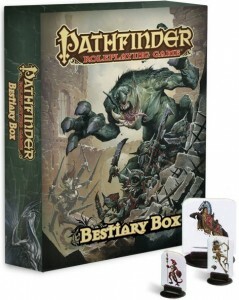 Pathfinder RPG players will find the creatures taken directly from the core monster book while other gamers will still find uses for the many nifty cardboard miniatures in the box. No matter what toys and presents the holidays bring, be sure to keep time in your schedule for playing with friends and family. While the games here come highly recommended to provide fun for a wide range of players, there are plenty other choices available. Ask your local game store or check some of our past recommendations and read the Unplugged Holiday Guides for 2010, 2009, and 2008. Good boardgames don’t go out of date.